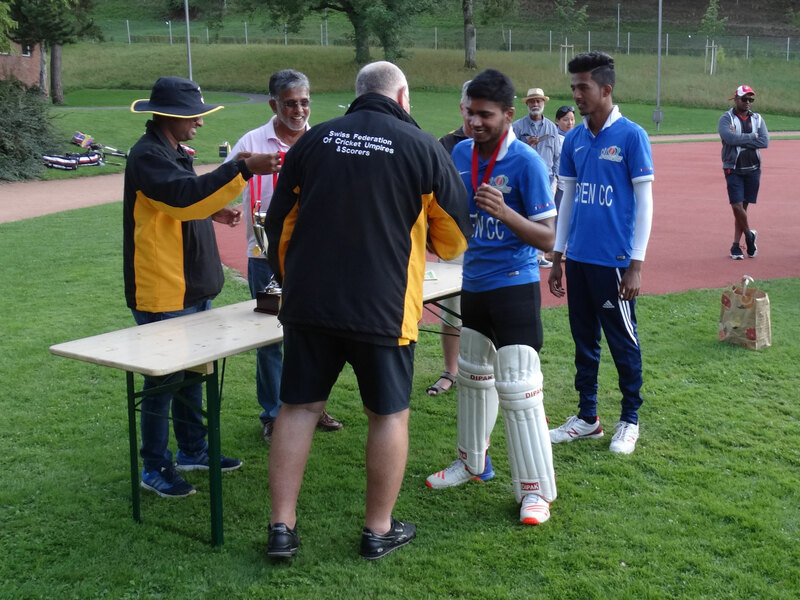 Olten Cricket Club won the Swiss Mr Pickwick T20 Cricket Final on Sunday 20th August at Schönau in Berne, beating St Gallen by 6 wickets. 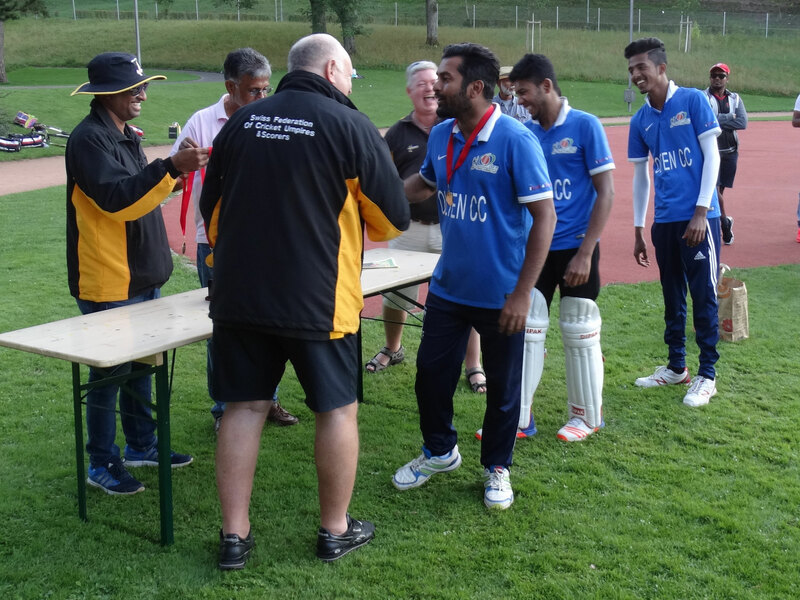 The four teams involved in the Swiss Mr Pickwick T20 Cricket Finals Day delivered the promise of a spectacular, action-packed day of Twenty20 cricket. 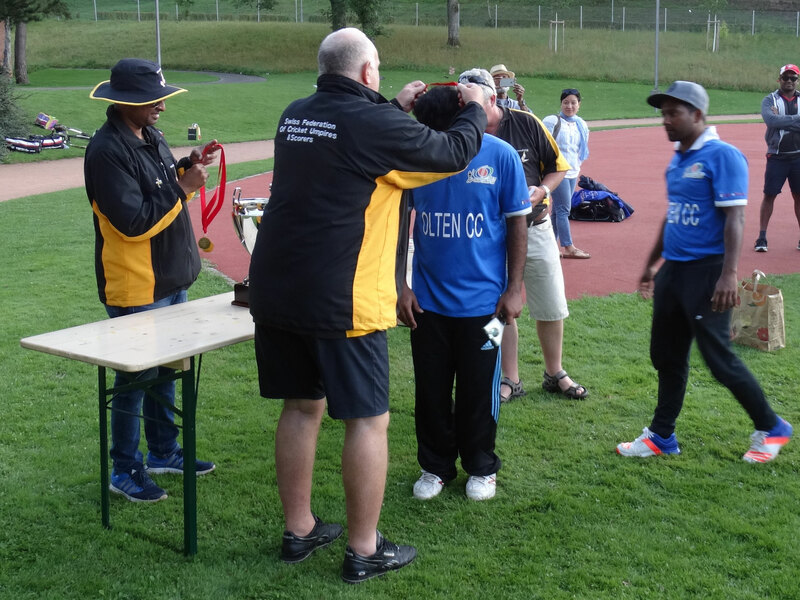 Olten won the early game in a low scoring match in the morning against Geneva, while St Gallen beat Geneva SL in a high-scoring second semi-final to set up a perfect climax to the 2017 campaign. Couldn't be there? 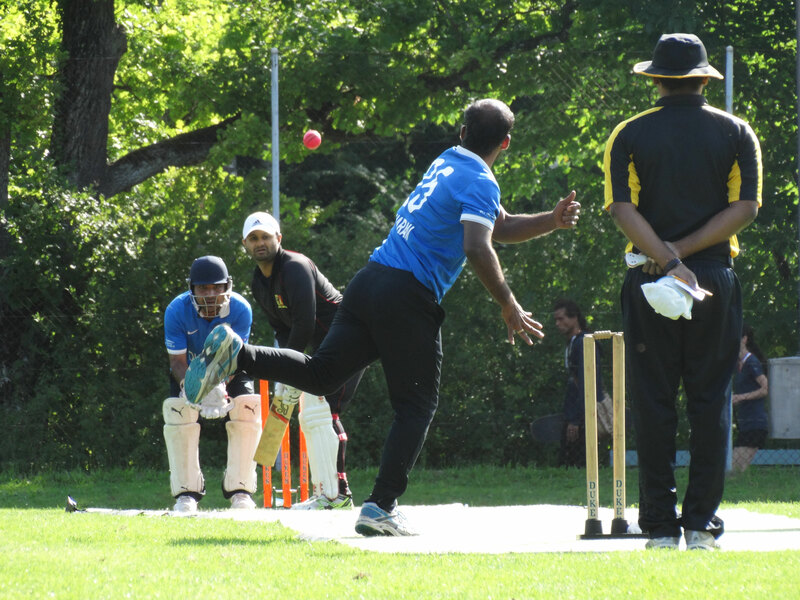 Did you follow the game live on CricHQ or Twitter then we would like to hear from you. 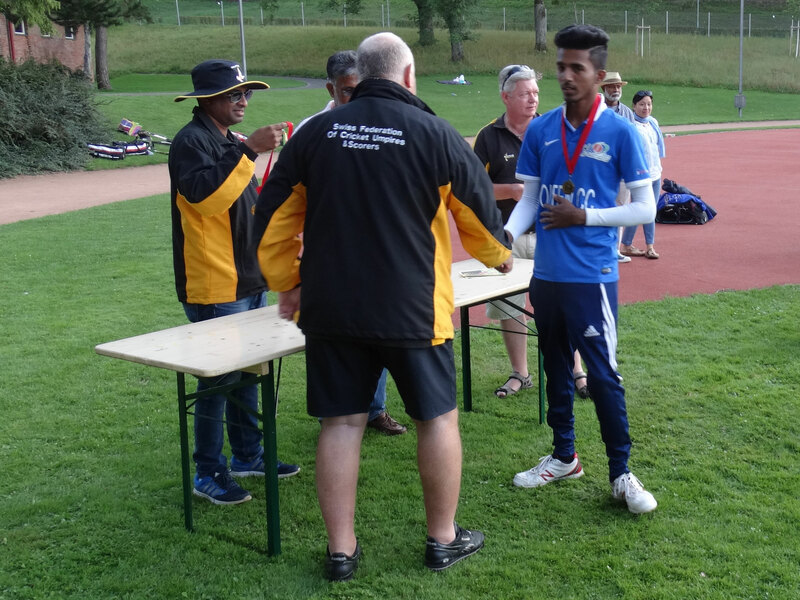 Geneva struggled on the softer Bern pitch & dew-covered outfield in the early game, finding runs hard to come by and giving away wickets too easily and on a regular basis. 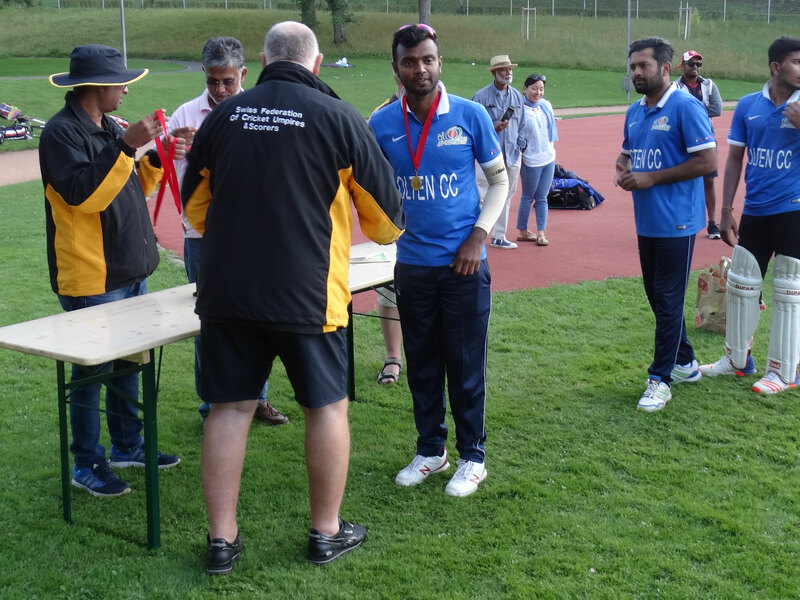 The Olten bowling attack did a great job, with only two Genevan batsmen reaching double figures, Geneva's innings ended 3.2 overs short of their allotted 20, setting Olten a conservative 80 run target to win. 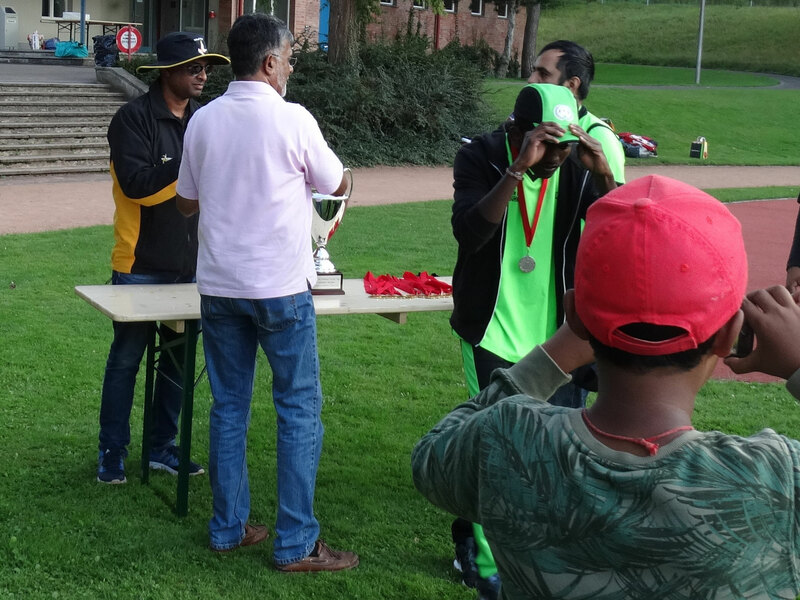 Olten on the other hand started their innings with all guns blazing, Shahid scoring an unbeaten 47 off 28 balls & J.Thirunakransa adding another 26 in just 16 balls, to reach the target in 8.4 overs. 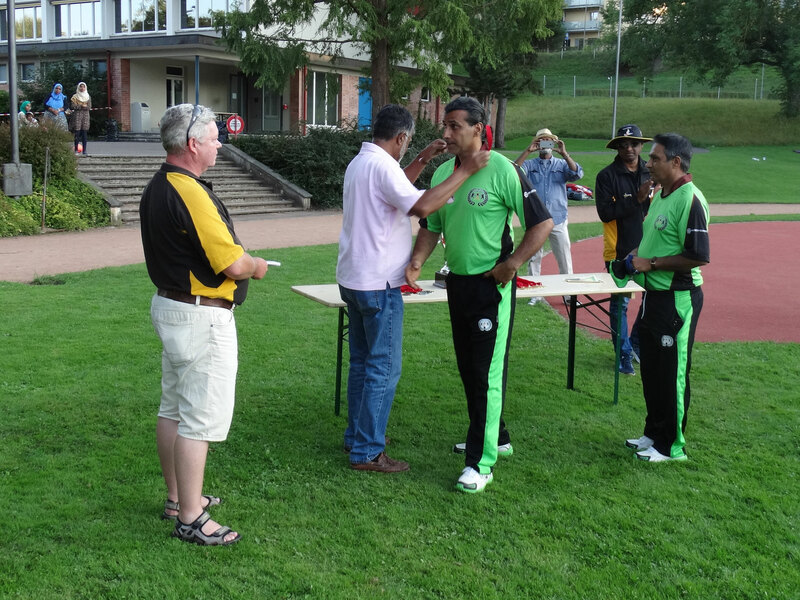 In the second game the 60+ crowd witnessed an explosive display from St Gallen as they set their opponents Geneva SL CC a target of 200 (exactly 10 an over) to progress to the final that evening. 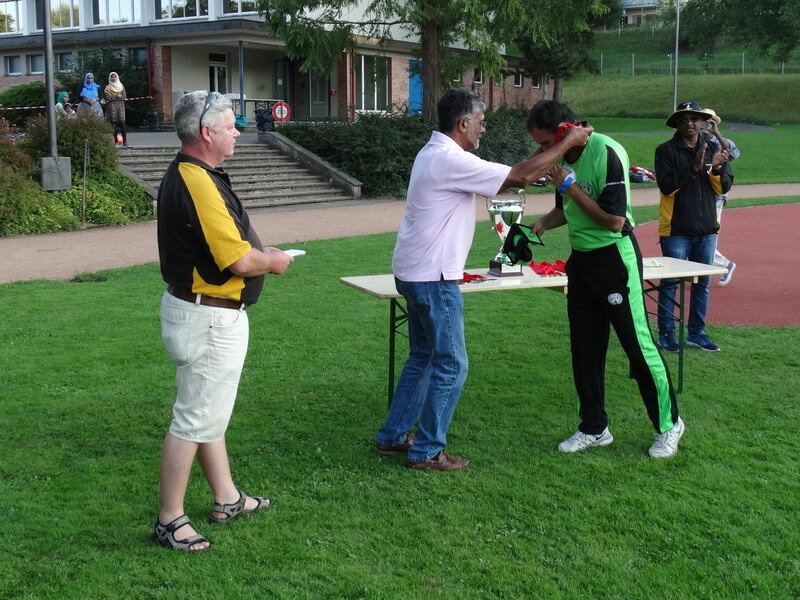 Young O.Mahmood got St Gallen off to a quick start but was soon caught in the deep by U.Bandaranayake off M.Selvarasa's second over. 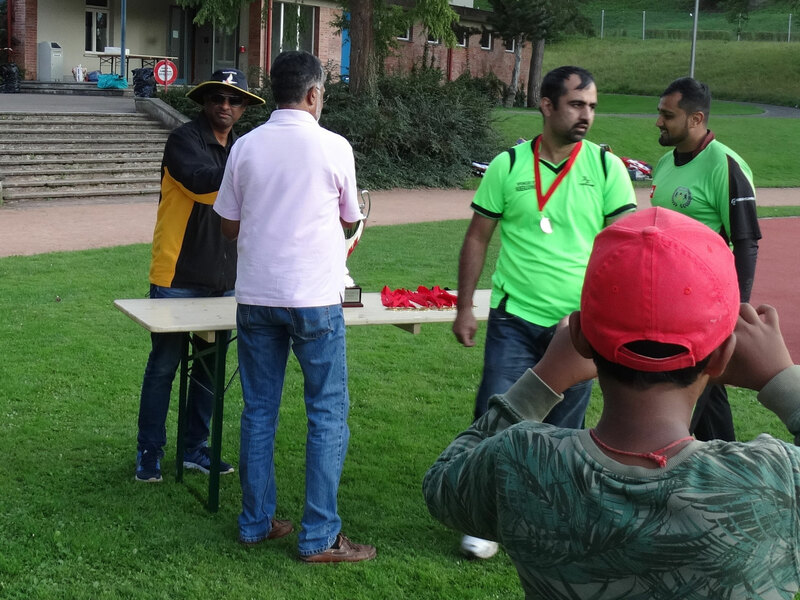 However, almost the entire St Gallen team made a double-digit contribution, AM.Mahmood (44) & Q.Mehar (49) the pick of the batsman. 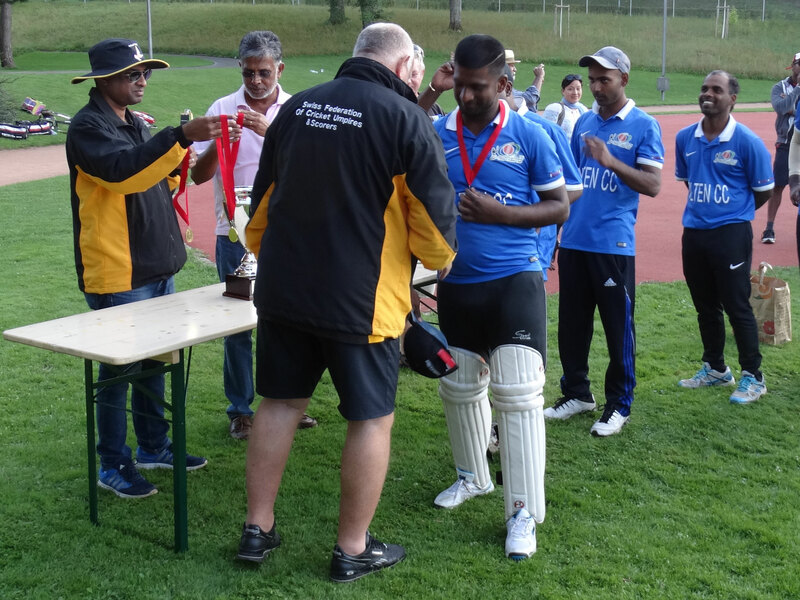 In contrast, only two GESL batsman contributed with double-figures in their innings, namely an unbeaten L.Sirisenage (25*) and opener S.Ranasingha (14). GESL tried to keep up with the task in hand, buoyed along by a vocal crowd. 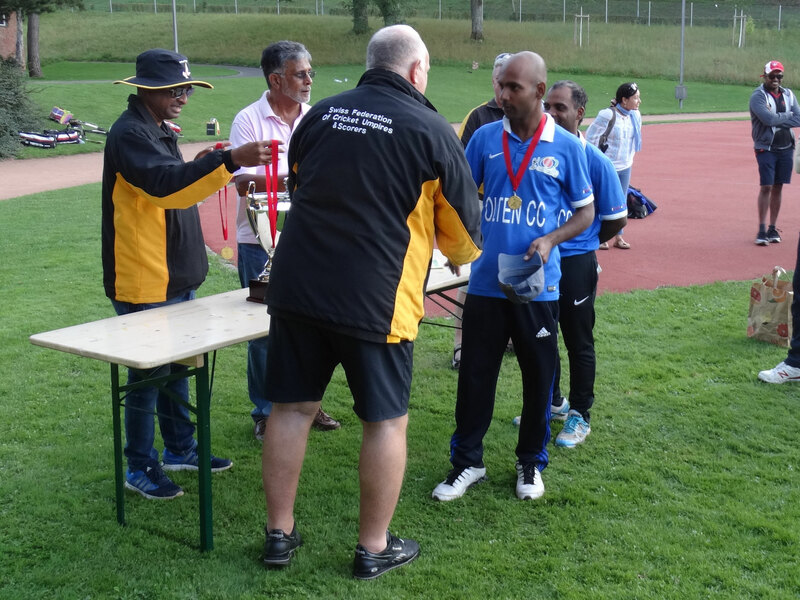 But with a serious injury to the GESL mid-over batsman, U.Bandaranayake (8), and a 20 minute break in proceedings while medical staff were called to the scene, the mood of the game changed and GESL appeared to lose the their desire. 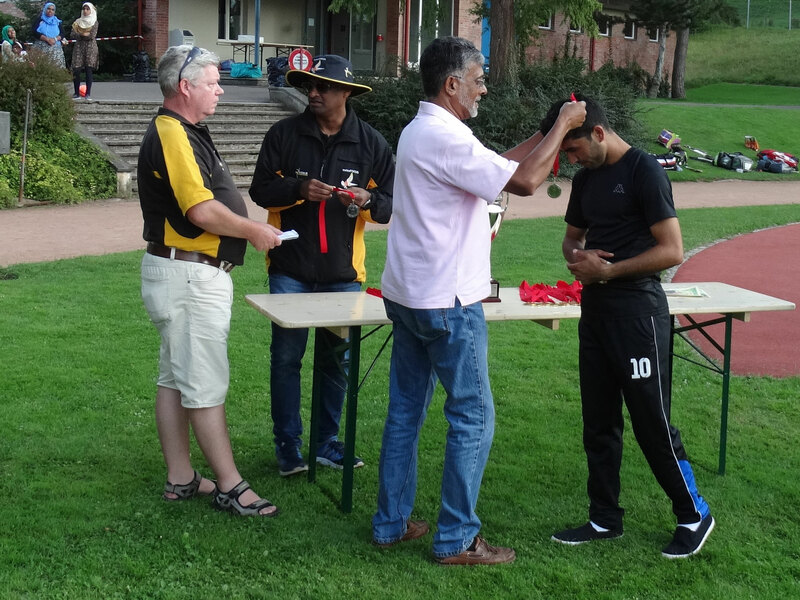 The remaining batsmen struggled to make any impact on the total and GESL were dismissed at the end of the 14th over, well short of the revised target to lose by 66 runs. 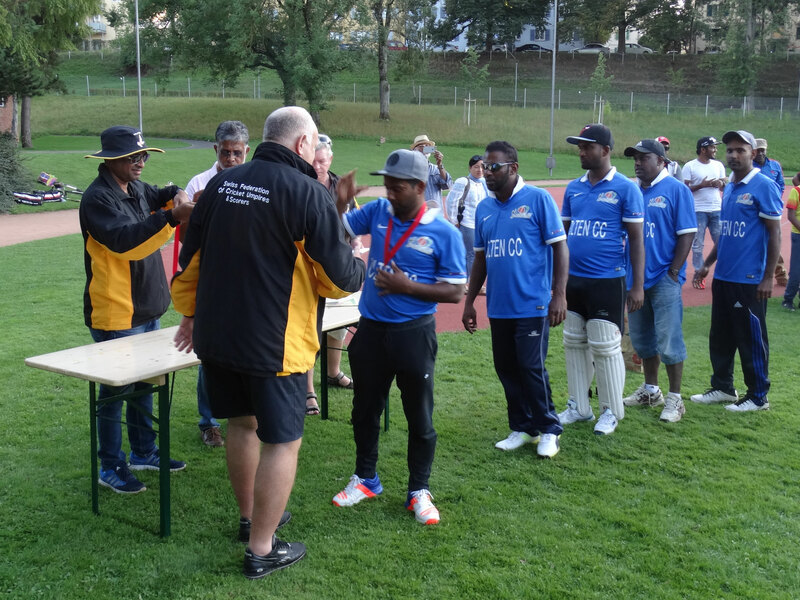 Encouraged by their semi-final batting performance St Gallen had no hesitation in batting first in the 2017 Swiss Mr Pickwick Twenty20 Cricket Trophy Final. 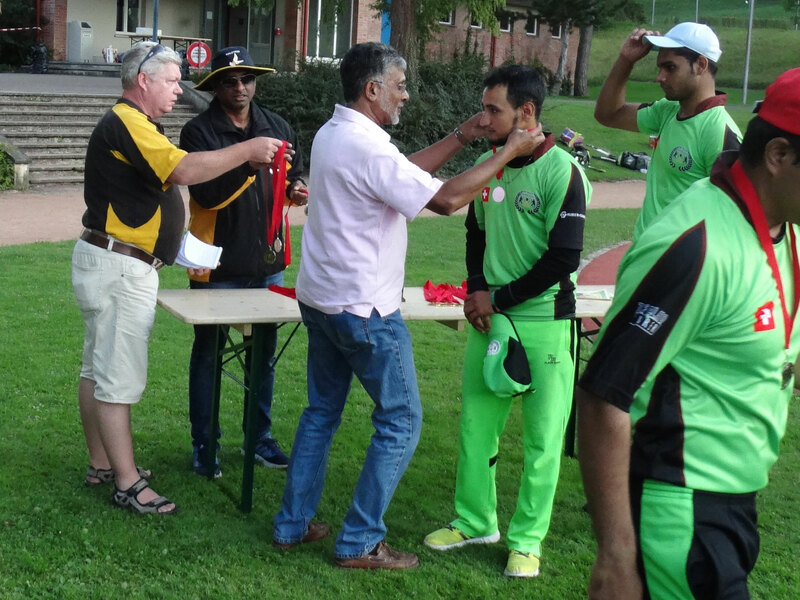 But things didn't start well when the two big hitting openers OM.Mahmood (1) and A.Abbas (6) were dismissed. 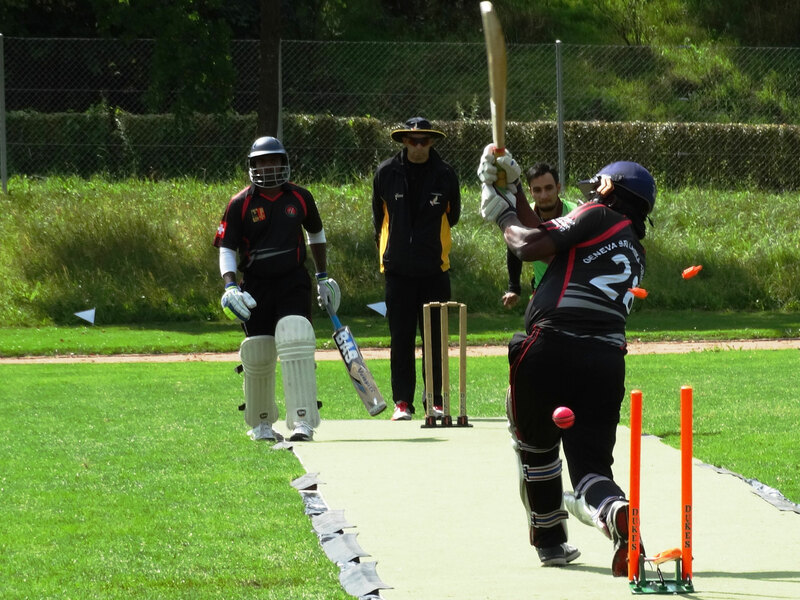 With both openers gone and St Gallen 18-2, you would have been forgiven if you thought the middle-order would set about steadying the innings. 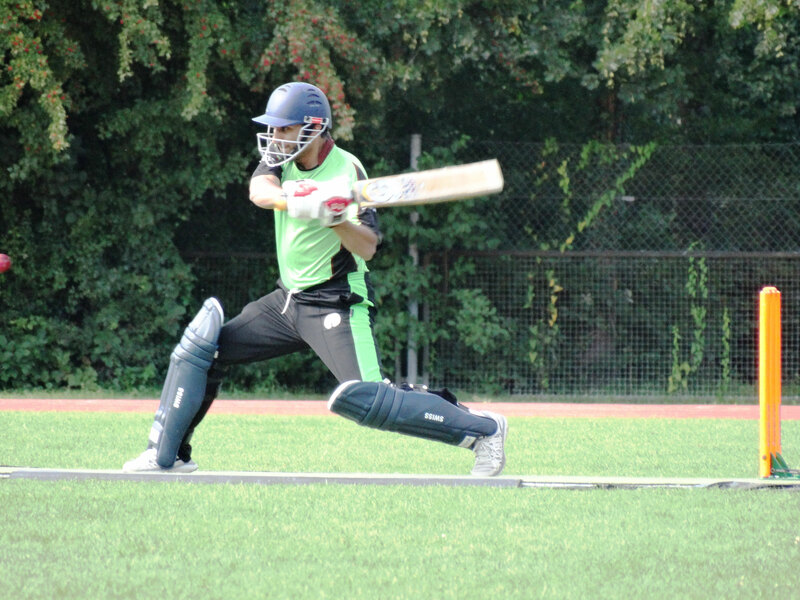 R.Kasle (17) did add some runs but just before the half-way stage St Gallen were 47-5. 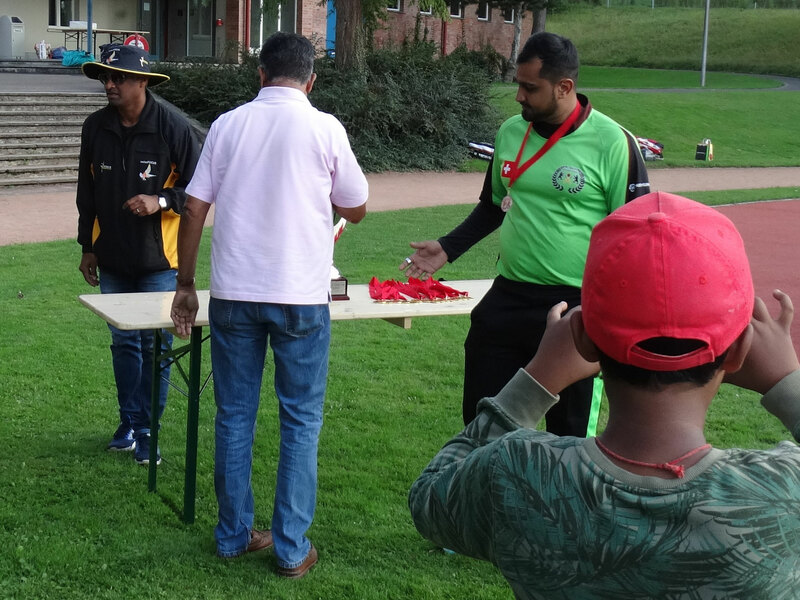 With the exception of AM.Mahmood (10), K.Bajwa (41) was the only batsman to contribute anything substantial, his compatriots at the other end all falling cheaply. 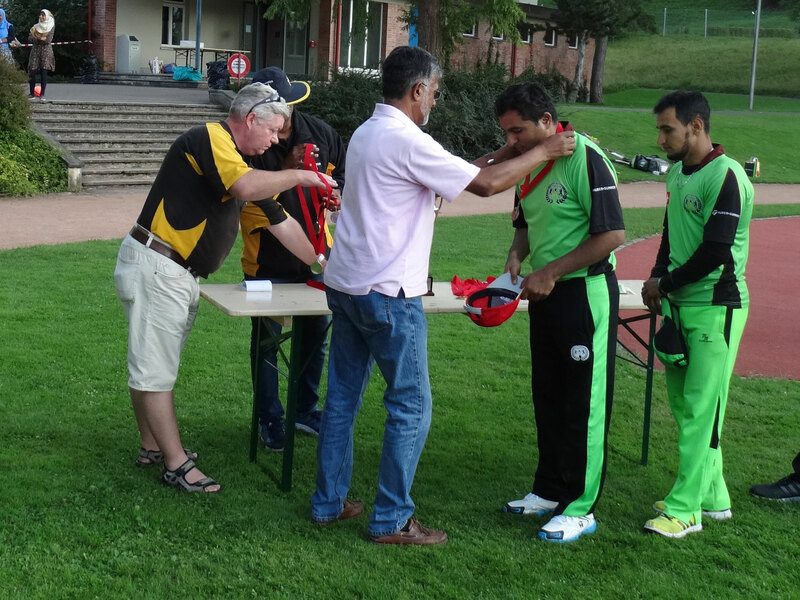 St Gallen had managed a very average 103ao, five balls short of their allotted 20 overs, all five Olten bowlers taking 2 wickets a piece. 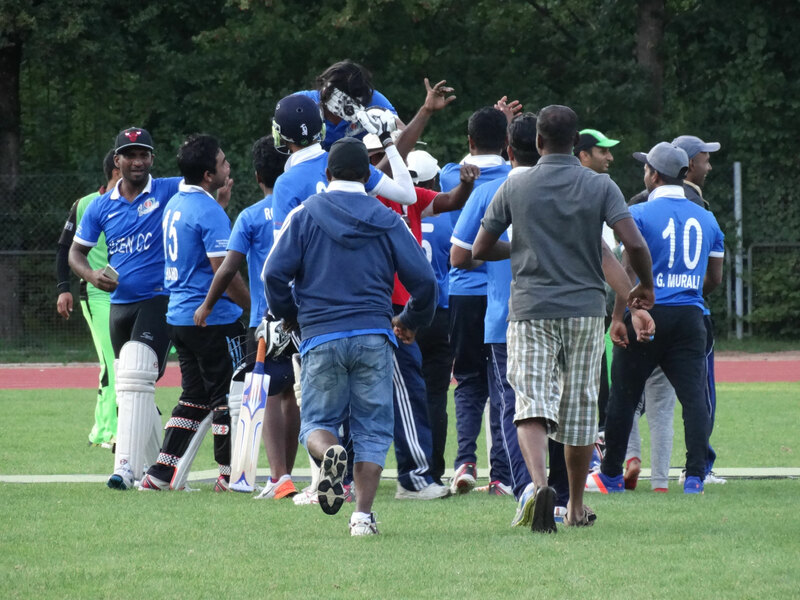 The second innings began well for St Gallen, J.Thirunakrasa caught for a duck in the second over. 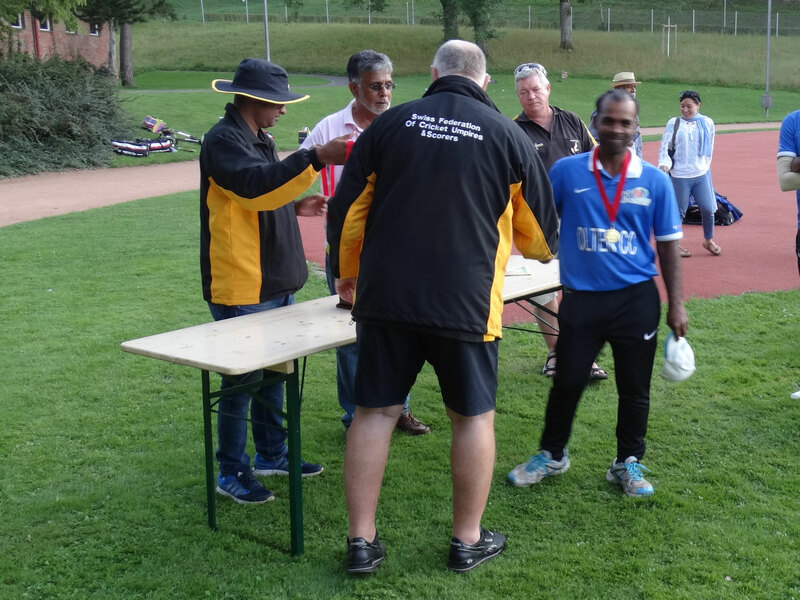 Olten 4-1. More success in the 3rd when M.Gnanesagaram (12) was dismissed. 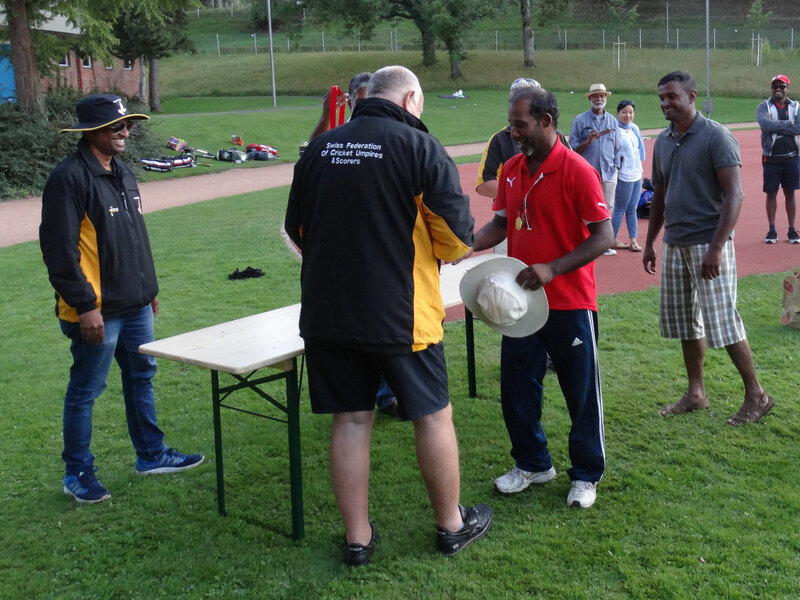 Olten now 17-2. But RJ.Jacob (14) supported AW.Shahid well to move the score to 42-3 off 8 overs. 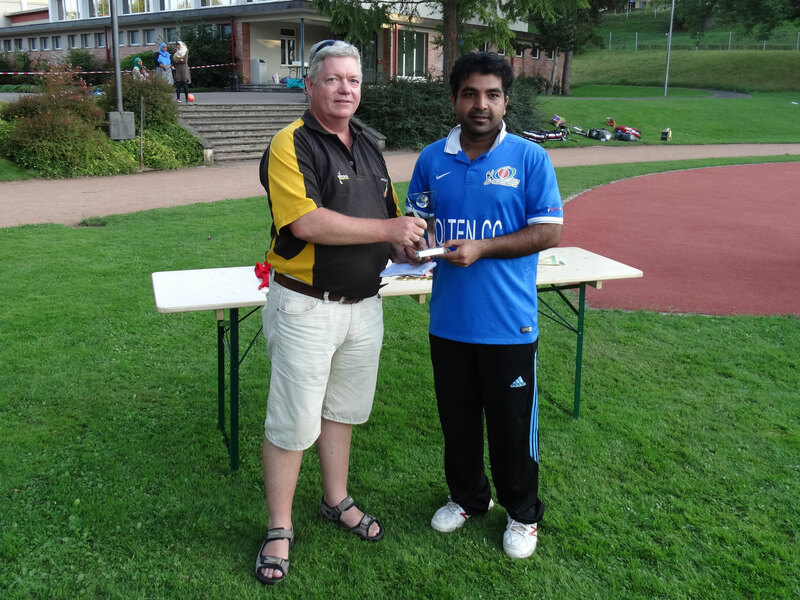 Olten were on target but losing wickets. This was going to be close. 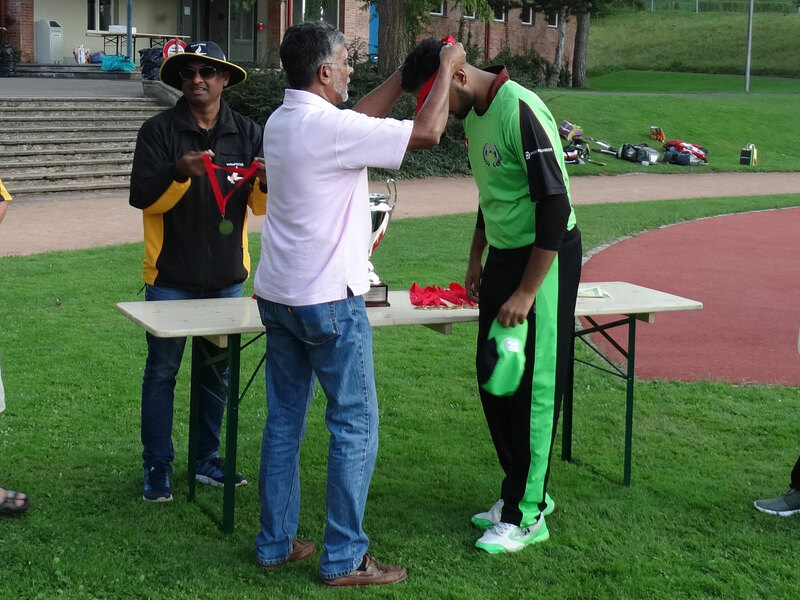 Introducing A.Nayyer (20*) who was left to score the winning runs with a big 6 after partnering AW.Shahid through the rest of the inning, AW.Shahid dismissed shortly before the end but doing enough to earn himself the MoM award and Olten the trophy. 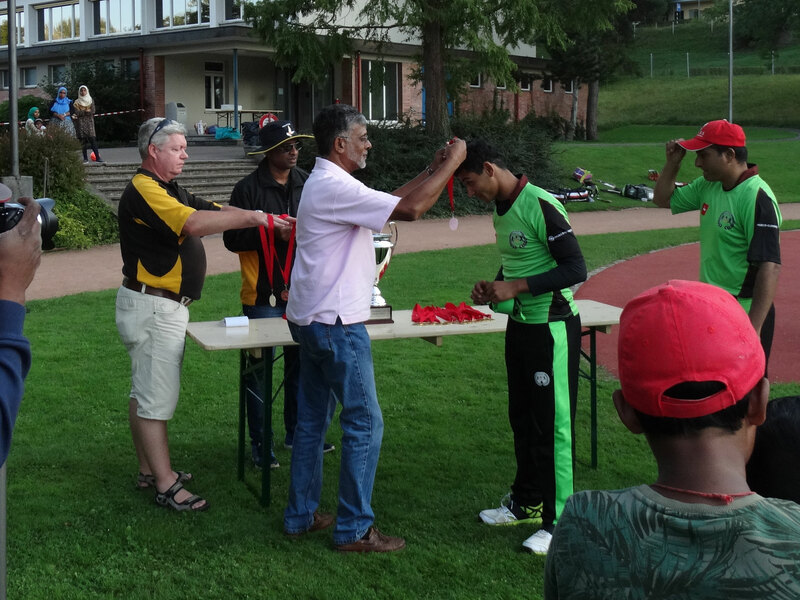 After a short speech thanking all those involved in putting on a great show, not least the caterers & ground staff, Cricket Switzerland Chairman, Alexander Mackay, outlined the development of this trophy from it's humble beginnings of a 35-over straight knockout competition into an exciting national-wide Twenty20 competition, and its role in Cricket Switzerland's success in developing cricket in Switzerland. 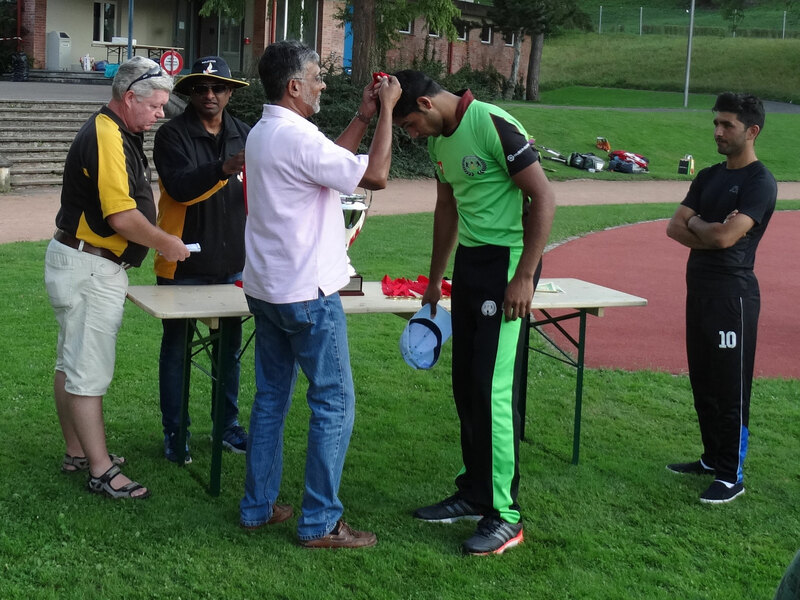 The President then proceeded to award AW.Shahid of Olten the MoM trophy. 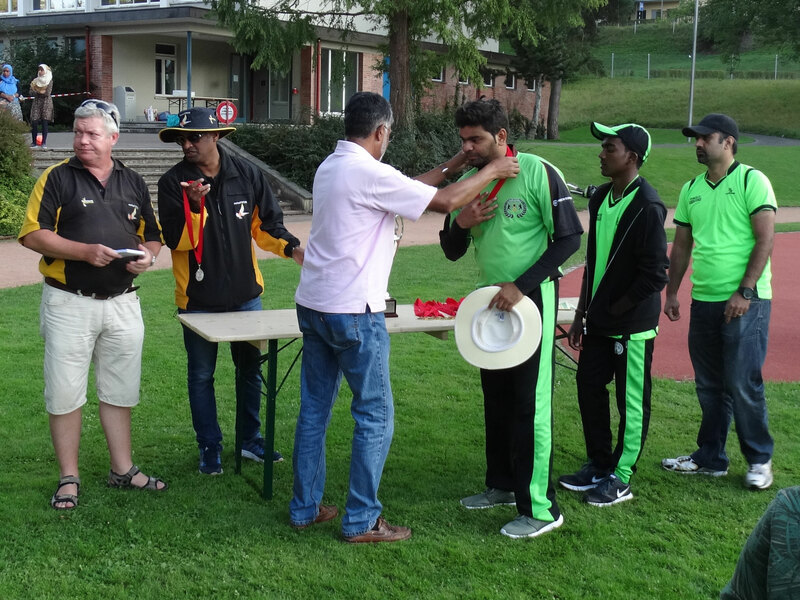 Led by Nasir Mahmood, St Gallen were invited to received their runners-up medals, presented by Cricket Switzerland's vice-President and Bern CC's Abrahm Koshy. 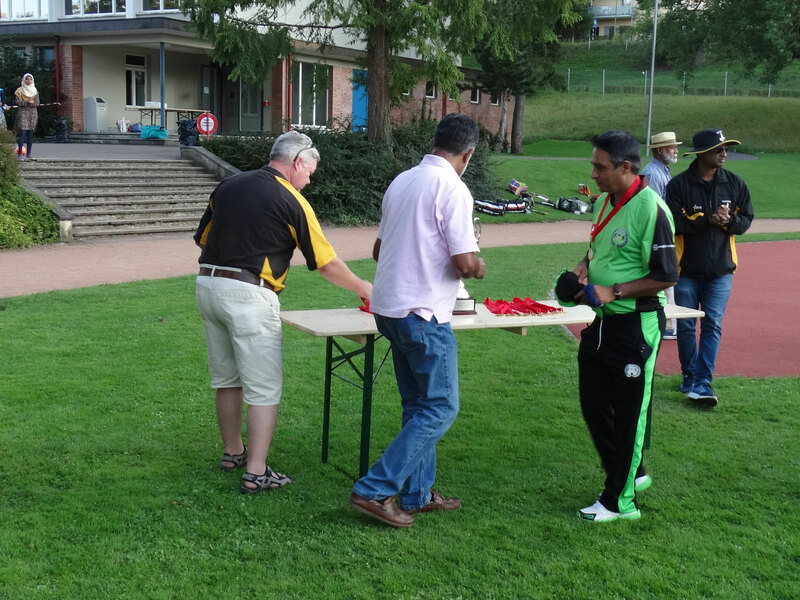 Clive Denney, Cricket Switzerland treasurer, awarded Ali Nayyar and his team the winners medals and finally Rik Busker, Manager of the Pickwick Pub in Bern, awarded Ali with the winners trophy. 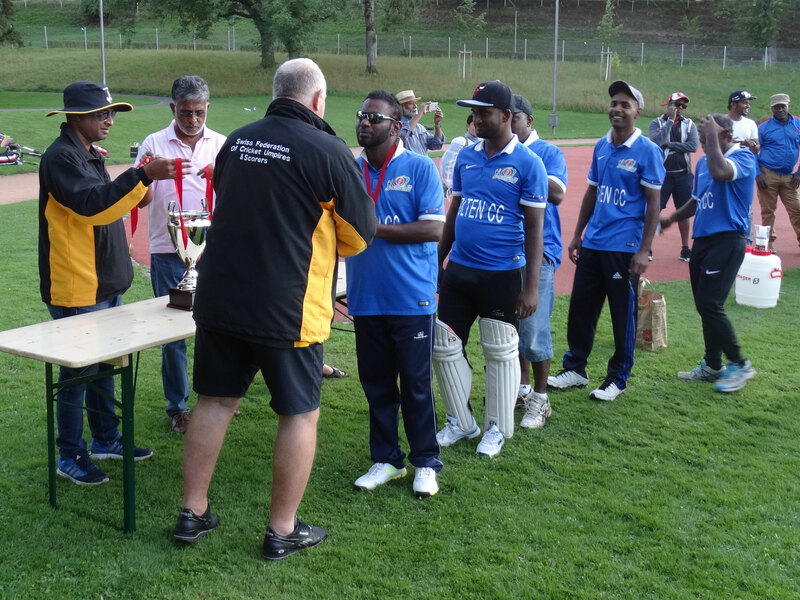 Cricket Switzerland acknowledges the Final's Day hosts Berne Cricket Club for their hospitality and for organising & supplying the facilities, lunches & drinks for the players, ground staff & officials. 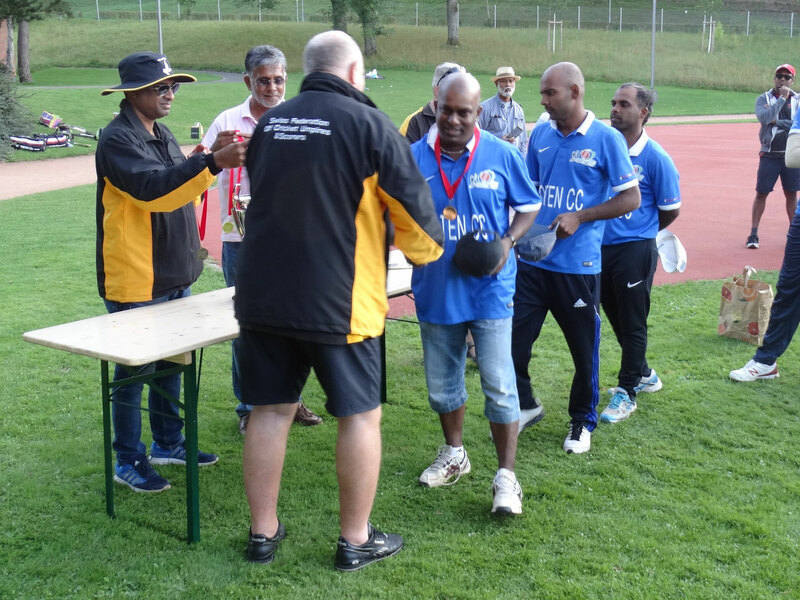 Thanks also go to the officials (umpires & scorers), the Competitions' Chairman, Asvin Lakkaraju, all the teams that participated in the competition but particularly the four semi-finalists and everyone that turned up to support the matches. 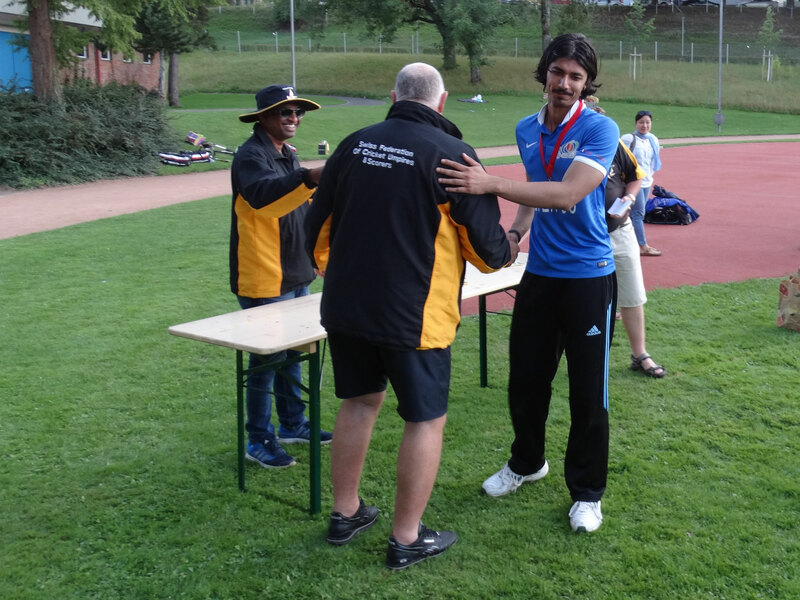 We also recognise the generosity and support of Mr Pickwick Pubs the competition sponsor. 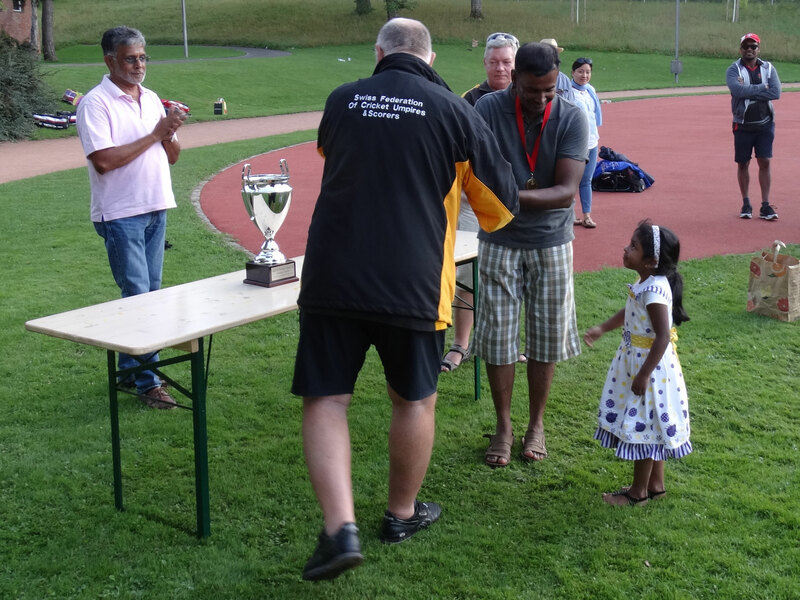 For further information contact Asvin Lakkaraju or Abraham Koshy.